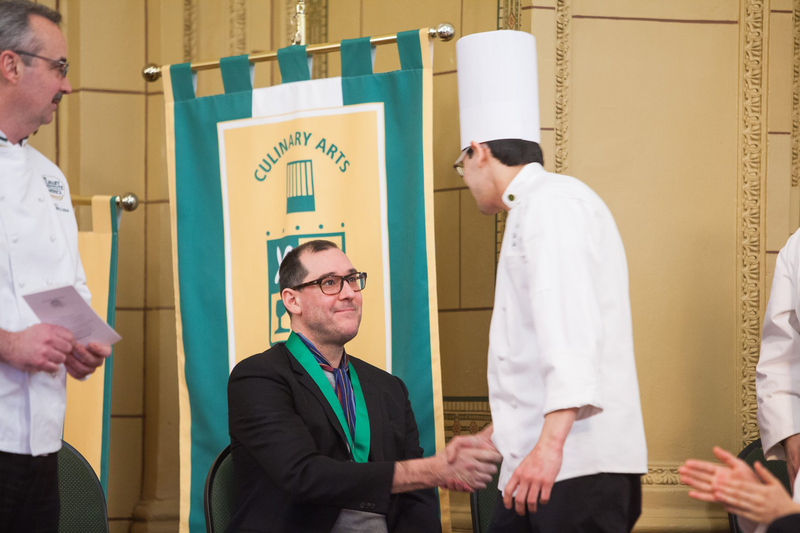 Hyde Park, NY – Mark Ladner, executive chef and partner of the Michelin-starred Del Posto and two other Italian restaurants in New York City, delivered the commencement address at The Culinary Institute of America (CIA) in Hyde Park, NY on Friday, February 7. He told the 46 graduates that he pursued a career in culinary arts after he "discovered" chickpeas at a restaurant salad bar as a child and thought, "What else is out there that I haven't tried?" "As you start your journey, don't lose sight of what inspired you to start to cook. Don't forget your chickpea," Chef Ladner advised recipients of associate degrees in culinary arts and baking and pastry arts. "Continue to be curious. Choose to always be a student, because the most wonderful epiphany can be found around any corner." Chef Ladner is a two-time nominee for the James Beard Foundation Award as Best Chef: New York City. When Del Posto received a four-star review from The New York Times in 2010, it became the first Italian restaurant in 36 years to earn that recognition. Del Posto and Ladner's other restaurants—Lupa Osteria Romana and Otto Enoteca Pizzeria—are part of the Batali & Bastianich Hospitality Group headed by Mario Batali and Joseph and Lydia Bastianich. CIA students can complete their externship field experience at all three restaurants. Ladner is also the co-author, with Batali, of Molto Gusto: Easy Italian Cooking (HarperCollins, 2010).